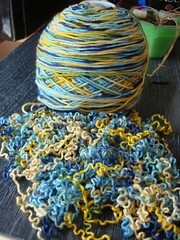 It seems like it has been a long time since I even showed you any knitting. But I am working on a few projects. My Central Park Hoodie has a completed back, and I am working on one of the front pieces. I accepted the fact that I am not a sock designer and ripped out this single sock that I designed myself. It was too small for even me, and I somehow made the pattern almost impossible to size (and sock patterns without a S, M, and L size are one of my pet peeves). 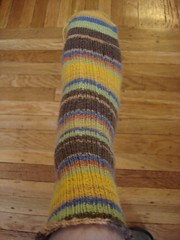 So the lovely STR will be reincarnated as a better fitting sock. 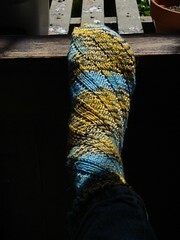 And I compeleted exactly half of a project by casting off one lonely sock. And I do think the casting off was the best part. Why didn’t anyone tell me about the picot bind off featured in knitty? 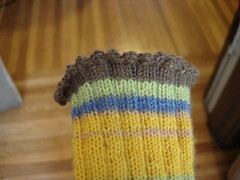 As a toe-up knitter, I was pretty happy to find these instructions and make a cute little bind off on these socks. There. I have been knitting. Don’t forget about my contest – Midnight Pacific time tonight (sat june 10) is the cut off, so please tell me about your favorite knitting/crafting tool/material. I love reading all of the comments! 4 Responses to "Do you even knit anymore?" I thought you knew about it! 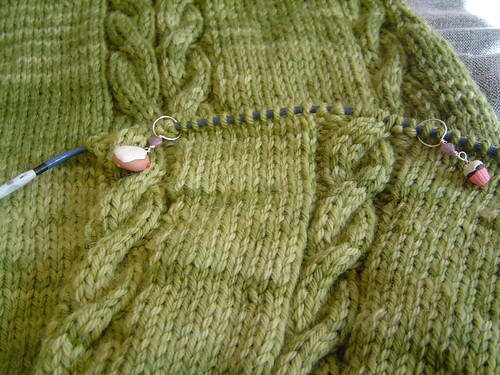 love the green yarn for the hoodie and especially the cupcake stitch markers – very cute!! Hi, What kind of yarn did you use on the CPHoodie? I’m looking for exactly that color. I’m also trying to find the pattern, any advice would be appreciated. Help, I am looking for 1 ball of Regia sock yarn Canadian Color 4733, do you have any to spare, to make another pair of socks. Can you help?? ?